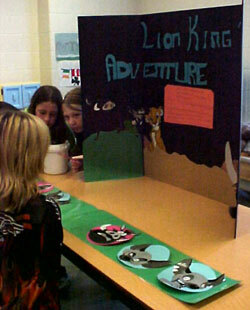 In a SNAP math fair, the focus is quite narrow: each project is a math puzzle that the students present to the visitors. The student presenters have control over their projects. They solve the puzzles on their own, transform them into an appropriate setting, prepare the artwork and the displays, and present the puzzles to the visitors. 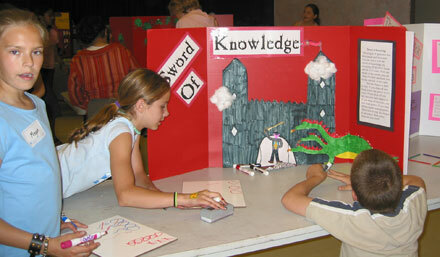 The students are experts about the puzzles, and they act as facilitators to help the visitors solve them. The puzzles themselves are interesting and challenging, and the students derive much pleasure in helping the visitors solve them. Here are three typical presentations, along with the puzzles in their original form. In this booth, the children are offering a puzzle that is very popular at SNAP math fairs. As far as we know, it originated in Quantum magazine. Here is the actual puzzle. "The dragon of ignorance has three heads and three tails. However, you can slay it with the sword of knowledge by cutting off all its heads and tails. With one swipe of the sword you can cut off one head, two heads, one tail, or two tails. When you cut off one head, a new one grows in its place. When you cut off one tail, two new tails replace it. When you cut off two tails, one new head grows. When you chop off two heads, nothing grows. Help the world by slaying the dragon of ignorance." The puzzle has been solved and presented by many elementary school students, and yet it is challenging to people at all levels. A teacher told us that her students were having difficulty with it, spending a fair amount of time without success. One of the students picked up a handful of pencils and erasers and said "OK. Let's use the erasers as the heads and the pencils as the tails." Apparently they solved it quite readily after this. Martin Gardner reports that this puzzle originated in Japan, where it is popular with school children. In the picture below, the children have taken ownership of the puzzle and adapted it to fit with the movie "Finding Nemo". "By moving the button and as few toothpicks as you can, make the fish swim in the opposite direction." This is a well-known puzzle that has been around for many years. The students have used a popular film to give a setting for the puzzle. "The three red chips and the three green chips have to change positions. The red chips can only be moved to the right, the green chips can only be moved to the left. A chip can move to an empty square if it is beside the empty square. A chip can jump over a different coloured chip as long as there is an empty square to land in. A chip cannot jump over two chips or over a chip of the same colour."